Meals don't come any fresher than this. Plate & Pitchfork is a dinner series for anyone who thinks vegetables grows in Aisle 4 of the supermarket. The company, started five years ago by two local Oregon foodies, organizes group dinners at local farms around the state. The evening begins with a tour of the fields, followed by an alfresco, family-style meal prepared by local chefs from ingredients just plucked from those same fields. The idea is to increase knowledge about the health and environmental benefits of eating locally produced food. Whether that message gets through or not, you'll still be guaranteed a great dinner. 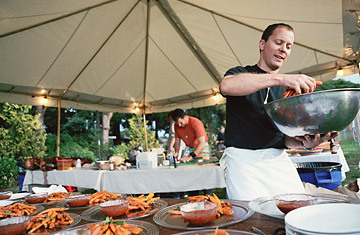 Call 503-241-0745 for tickets, $90$150 per person.